MarketOne today announces a strategic partnership with predictive analytics provider Mintigo. 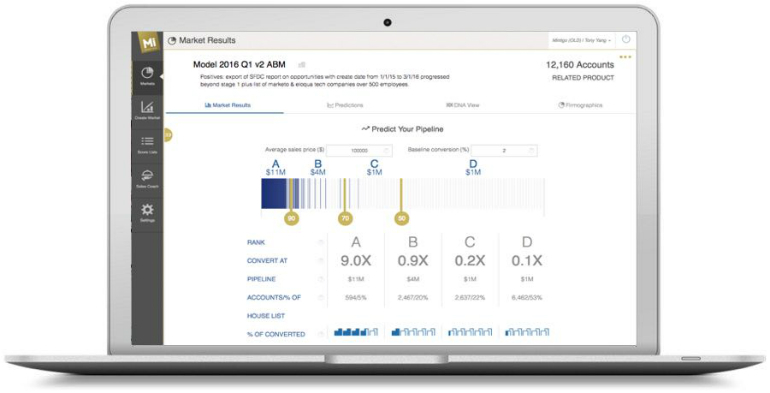 Together, MarketOne and Mintigo will enable B2B customers to unlock the value of predictive sales and marketing intelligence through innovative account-based marketing (ABM) programs. Mintigo leverages its R&D team’s exceptional pedigree in data science to aggregate and mine thousands of known facts across millions of companies. Algorithms combine this third-party data with customers’ first-party data, then predictive models and artificial intelligence identify the contacts and accounts with the highest propensity to purchase, and the customers most receptive to cross- and up-sell offers, or at risk of churn. In turn, MarketOne develops a segment-based marketing strategy, defining the most appropriate treatment for each segment: how and where to reach people, what messaging and content is likely to resonate, and what information to gather to enhance understanding. A test-measure-learn approach to execution ensures ROI can be proven and clients know when to persevere or pivot.